What if you didn’t need a rulebook to play a game? What if you had an AI that was able to teach you how to play, keep track of what needs keeping track of, and effectively act as gamesmaster? 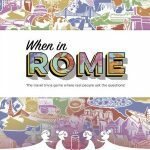 That is where When in Rome from Voice Originals comes in – it’s the world’s first Alexa powered board game. Is this an ideal solution, the perfect nightmare, or somewhere in between? Ok, so before we dive in to the good and the bad, let’s talk about what When in Rome really is. It comes in a compact box and has some lovely components – a button, a thimble, a plectrum, a ring, a key, some cards, a board showing a map of the world, some waving characters and two planes. 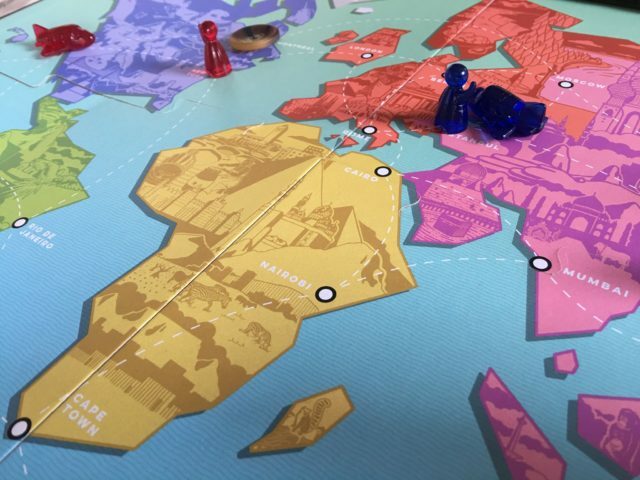 Essentially the game is a trivia game, where you travel the world. Answering trivia questions posed by “real” locals, to earn points, and if you are lucky, collecting souvenirs of your travels. Players split into two teams, and take turns to move around the board answering questions, with occasional tie-breakers to decide who goes next. Winner is the person with the most points after 3 souvenirs have been found. So how does Alexa play into this? Well she is the games master. You need to enable the When in Rome skill in the Alexa app, and then tell Alexa to play the game. The first time you play the game, you will be asked to read out your “packing” list, printed on the back of the board – presumably to ensure you have a copy of the game rather than just using the free skill to give you a trivia quiz. She guides you through the set up and talks you through the game, introducing a local to the place you visit on the board, and they ask you a trivia question coupled with a little local knowledge. Choose the difficulty (3 or 5 points), get it right, earn the points, and you have made a friend at that location, enabling you to move through it for free instead of it counting as a space. She also keeps track of the questions you have been asked to prevent repetition. From time to time Alexa will interrupt the game to tell you she has heard that a memento is in a particular city. At first we thought this was random, but it soon became clear that the location chosen for the memento is always exactly 2 cities away from both teams so no-one is disadvantaged. Answer a question correctly at the town where the memento is, and that’s worth an extra 7 points, on top of the points you earned from the question. This makes the game pretty even, as if you are way behind in the points, a difficult question and a memento can completely change things around. Some of the tie-breaker questions reward you with a card which you can use to avoid answering a question, or skip to a specific location – you may ask how on earth Alexa can keep track of cards in the game? The answer is at the same time both simple, and really clever. Both teams deck of 7 cards is the same, jump to London, Tokyo, Nairobi, Skip the head-to-head, Insult the other team, get a hint, get a different question. To help Alexa out, each card has a different activation phrase, so for the ‘jump to London’, after saying “Alexa, upgrade please”, blue’s card says “I want to meet a beefeater”, whereas red’s says “I need to see some pigeons right now!”. It means Alexa knows which team is playing the card, even though both teams might have the same ones, and the phrases themselves often raise a smile. So how does it play? Well the game itself is pretty basic, you are moving round the board, answering questions to earn points. The upgrade cards are a nice touch adding some variety to the game and enabling some shortcuts, but essentially it’s a glorified trivia game. The first time we played it, we did run into a few technical issues with Alexa mishearing an answer as a request to do something else, such as creating a reminder, taking us “out of the game”. However, we relaunched the skill and were able to continue where we left off without a problem. However the main issues we had with the game, are twofold – some of the questions are genuinely interesting with unexpected answers that you end up discussing amongst yourselves. However, Alexa is oblivious to the discussion and has carried on talking away to you in the background and you have missed the next bit of the game. The other issue, was that once you are familiar with the game, Alexa still insists on telling you what do you “you have made a new friend in Nairobi, remember to place a blue friend token here” – we already know and we’ve already done it, and now we are just waiting for Alexa to finish telling us to do something we’ve already done, and all we want is the next question! So in summary, this is a fascinating development in board games, that in general works really well. The actual implementation may cause a few niggles, but as this is software based, it could in theory be easily updated (although my only concern is that if the app goes away, you’re left with nothing more than a box of components). For £25 I think this is a little steep for the amount of entertainment it provides – don’t expect to be playing it all evening – but the quick setup and the fact that Alexa talks you through everything means it is a great game to bring out when you have friends round.